The Church Administrator’s job description includes supporting the Church’s core value, mission, vision, and various ministries. 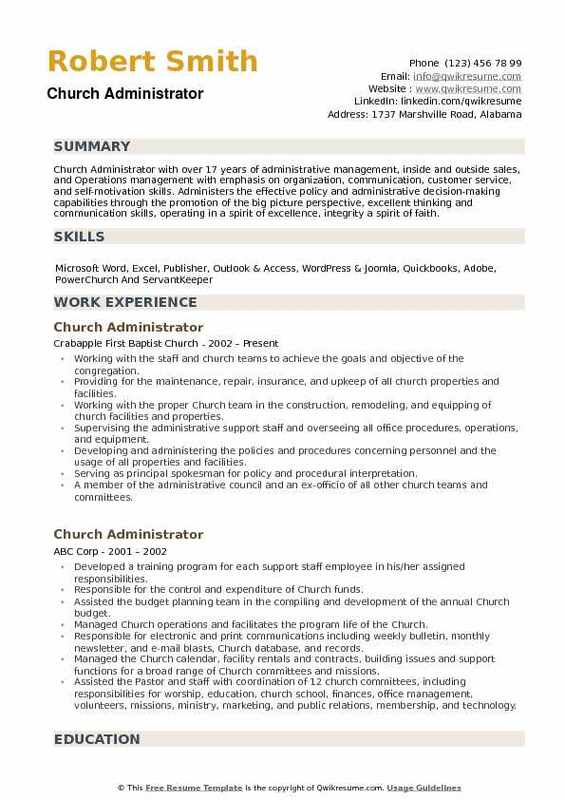 The major duties included on the Church Administrator Resume are – handling the day-to-day operations of the church, managing money matters such as budgets, cash flow, and payroll; maintaining personal records, supervising clerical and administrative staff, assisting Pastors, managing the Church’s website, magazine, bulletins, announcements, newsletter and other publicities; overseeing and maintaining the Church building, keeping an eye on Church’s inventory, administering the records, and keeping the Church away from any sort of conflicts. 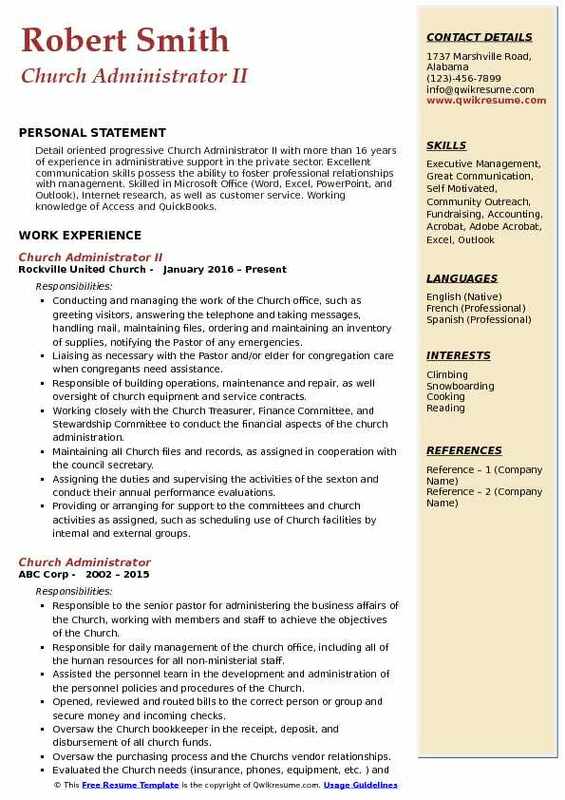 The required knowledge, skill, and abilities for this role include –demonstrable leadership and interpersonal skills, exceptional mathematical abilities, excellent record keeping abilities, strong technological abilities, bookkeeping skills, and above all, strong knowledge and support for the Church’s mission, statement, belief, and commitment. 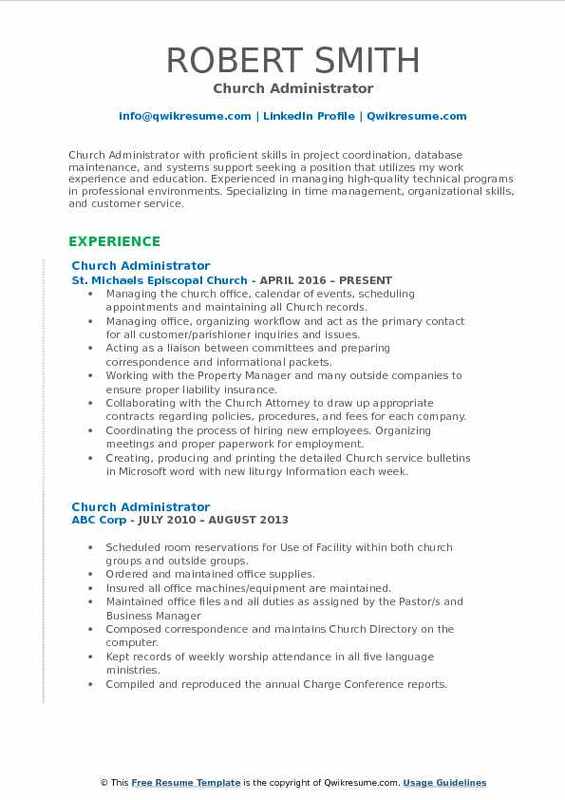 A Degree in Religious studies along with a certified Church Administrator designation is seen on successful resumes. Summary : An experienced seasoned minister with over 25 years of experience, serving as Church Administrator of a mega-ministry, established a non-profit Community Development Corporation and served as President, Sales/Manager, Business Development Consultant, Business Owner, Assistant Pastor, Senior Pastor and Associate Pastor. Effective communicator capable of supporting comprehensive business initiatives and policies, work effectively with team members at all levels. Managing routine office tasks like filing, ordering supplies, maintenance of copiers, room booking and sending faxes. Maintaining inventory of office supplies and order necessary materials. Receiving phone messages and forwarding to the Pastor and/or appropriate personnel. Representing the Church in church meeting/conferences by keeping minutes and reading them at the next scheduled meeting as needed. Preparing and keeping the employee information and maintaining the Church records in a locked file cabinet. Assuming the responsibilities for day to day operation of the residential facility. Developing and directing the residential programs and ensuring the implementation is in accordance with the Church philosophy and values. Developing and ensure compliance with the local and state licensing standards. Functioning as a team member, supporting and being accountable to all staff and participating team meetings by representing the program perspective. 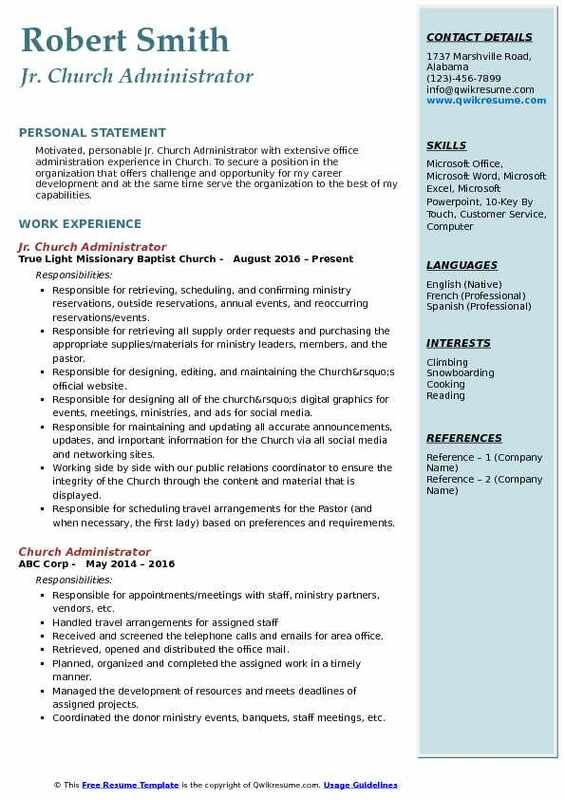 Summary : Church Administrator with 13 years of experience is looking to obtain a challenging position allowing me to utilize my interpersonal, leadership, sales development, and exemplary communication experience to grow, excel, and actively contribute to a professional position through a life-long career within a growing company that is committed to their employees, customers, and future innovation. Approving all Church marketing communications, coordinating the Church calendar and facility usage, property and building management, building access security. Manage the Church congregational database management systems. Coordinating the ministry team meetings with Church lay leaders, staff, and volunteers. Managing the daily operations of the office. Daily supervision of branch operations, personnel, audits, security, and promoting exceptional customer service. Teaching the Bible studies to various groups- including writing curriculum- 2-4 times per week. Implementing and regulating the internal controls for the safety and protection of underage children within the congregation. Implementing and regulating the internal controls for the handling of finances per approval the lead pastor and board of directors. Overseeing all ministries of the assembly, under the direction and instruction of the lead Pastor and is answerable to the lead Pastor for all departments and ministry activities and functions. 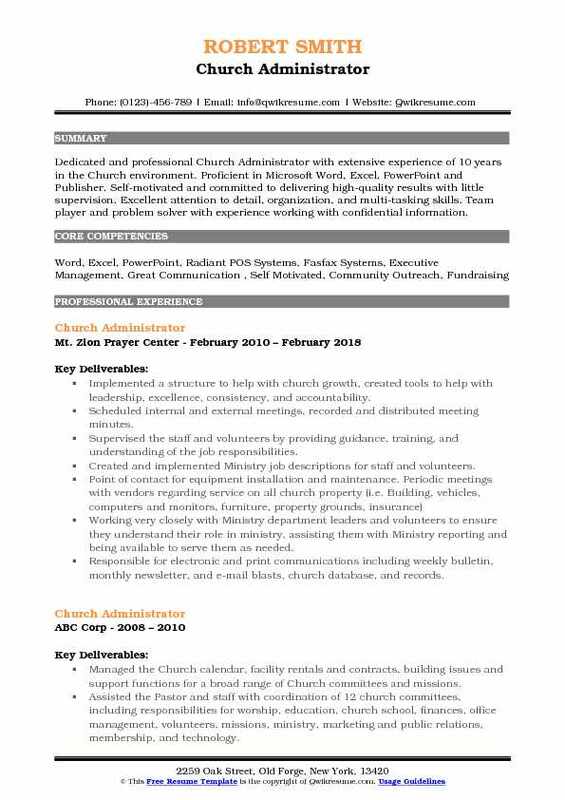 Summary : Accomplished Senior Church Administrator with diverse experience of 7 years in Church administration, executive support, and events management. Frequently commended for being highly organized, reliable, and knowledgeable. Savvy solutions provider with a high level of integrity and commitment in every endeavor. Demonstrated success making operational modifications to deliver maximum efficiency and productivity. Required to maintain the confidentiality of sensitive and personal matters of the Pastor, members of the congregation, and people in the community. Maintaining the electronic Church calendar. Scheduling the use of the building, with thorough tracking of rooms, spaces, and activities. Maintaining the membership information database "Servant Keeper. " Updating and backing up the system as required. Assisting the Pastor in creating the Sunday and Wednesday bulletins using Word Perfect and Publisher. Scheduling and recording the weddings, baptisms and funerals and types appropriate certificates. Typing, duplicating and editing/proofreading the letters and other materials at the request of the Pastor. Serving as one of the primary contact people with the public and congregation. Answering the telephone responding to the office email and sorts the postal mail. Maintaining the purchase order system for all purchases made in the church. Overseeing the office budget, orders all office equipment and supplies. Headline : Church Administrator with proficient skills in project coordination, database maintenance, and systems support seeking a position that utilizes my work experience and education. Experienced in managing high-quality technical programs in professional environments. Specializing in time management, organizational skills, and customer service. Skills : Bookkeeping, Microsoft Office, Technical Support, Database Management, Project Coordination, Database Management, Microsoft Office Suite, Technical Support, Business Process Improvements. Managing the church office, calendar of events, scheduling appointments and maintaining all Church records. Managing office, organizing workflow and act as the primary contact for all customer/parishioner inquiries and issues. Acting as a liaison between committees and preparing correspondence and informational packets. Working with the Property Manager and many outside companies to ensure proper liability insurance. Collaborating with the Church Attorney to draw up appropriate contracts regarding policies, procedures, and fees for each company. Coordinating the process of hiring new employees. Organizing meetings and proper paperwork for employment. Creating, producing and printing the detailed Church service bulletins in Microsoft word with new liturgy Information each week. Streamlining the process by creating a template document to improve time. Implementing, designing and printing the church newsletter organizing content from several groups weekly. Write articles with information regarding the event. Organizing the layout of the publication and using different graphics to draw attention to the articles. 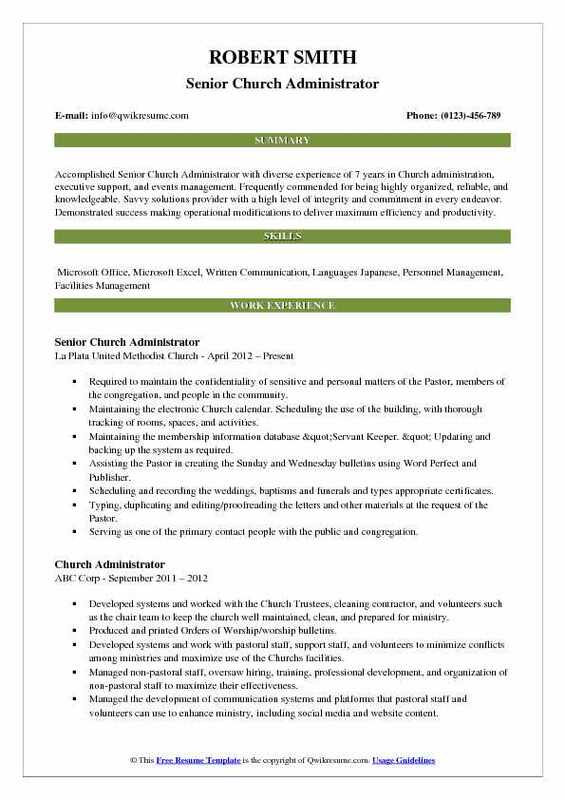 Objective : Motivated, personable Jr. Church Administrator with extensive office administration experience in Church. To secure a position in the organization that offers challenge and opportunity for my career development and at the same time serve the organization to the best of my capabilities. Responsible for retrieving, scheduling, and confirming ministry reservations, outside reservations, annual events, and reoccurring reservations/events. Responsible for retrieving all supply order requests and purchasing the appropriate supplies/materials for ministry leaders, members, and the pastor. Responsible for designing, editing, and maintaining the Church’s official website. Responsible for designing all of the church’s digital graphics for events, meetings, ministries, and ads for social media. Responsible for maintaining and updating all accurate announcements, updates, and important information for the Church via all social media and networking sites. Working side by side with our public relations coordinator to ensure the integrity of the Church through the content and material that is displayed. Responsible for scheduling travel arrangements for the Pastor (and when necessary, the first lady) based on preferences and requirements. 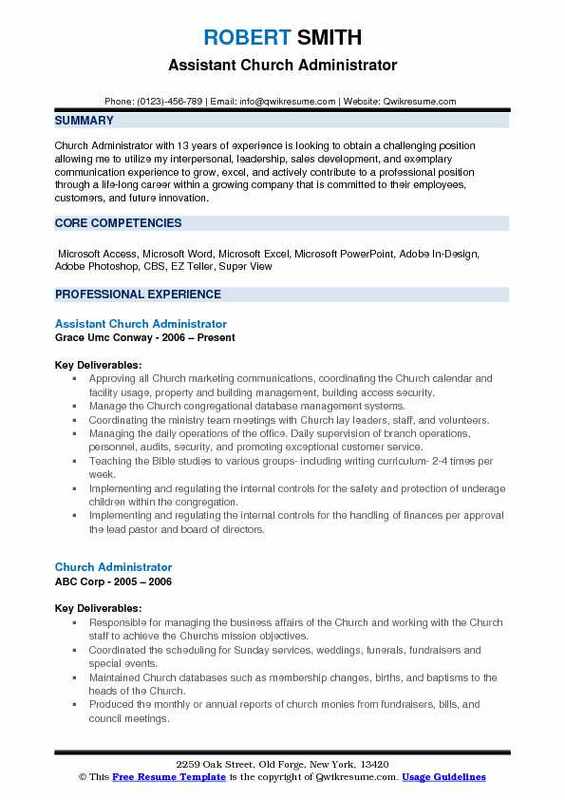 Responsible for coordinating and communicating with administrators of other churches for pastoral accommodations, reservations, events, etc. Headline : Highly motivated, results-oriented Church Administrator with a successful career reflecting proven experience, accomplishments and a talent for managing profitable operations. Goal-oriented, proactive and successful in implementing business strategies, leading change, increasing sales and improving profit. Consistently exhibits a high-level of business ethics and performance standards. Responsible for all building and grounds, financial and budget-related analysis and reporting, and human resources policies and procedures. Created new building use policy and fee schedule for all church groups and outside organizations who used and rented spaces on the campus. Managed Church event calendar and scheduled all meetings and events for the entire campus. Collected bids and oversaw the repair and replacement of the irrigation system for the entire church campus, the replacement of the sound system in the chapel and the repair of one of the Church's two boiler systems ensuring heat in a timely manner for the winter season. Oversaw the complete renovation of all outdoor lighting on the Church campus. Converted all lighting to led ensuring the campus would be safer and more secure at night, and dramatically reduce energy consumption, in keeping with the congregation's commitment to ecological justice. Managed all day to day repairs and maintenance of Church and pre-school. Worked through three Church sextons to manage the day to day cleaning of all spaces on the entire Church campus. 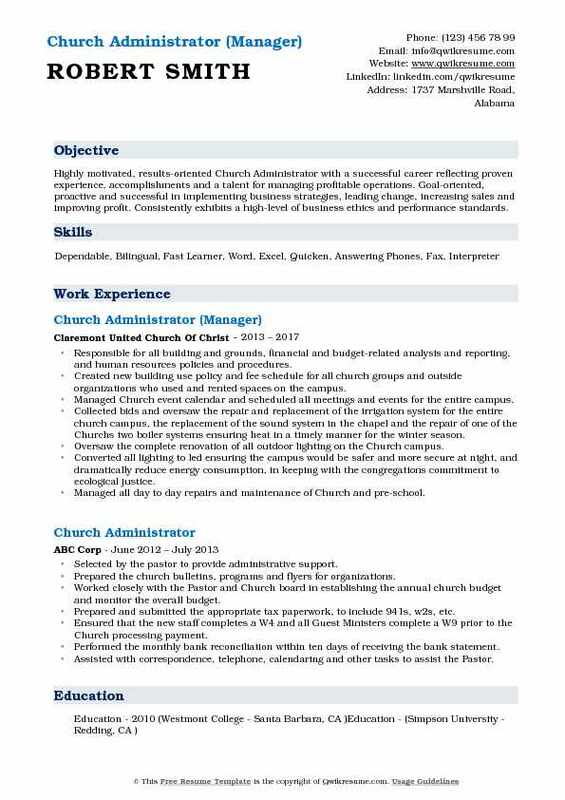 Summary : Church Administrator with 8 years of experience and a strong experience of Church administration and finance management. Familiarity with all the religious process carried out in Church. Ability to work with pastors, preachers, and church staff. Appointments Scheduling Meeting and Travel Arrangements. Skilled in monitoring and overseeing maintenance work of the Church. Ability to prepare an annual budget and establish visions and long-term goals for the Church. Primary point of contact for the congregation and visitors and screen calls and email for the Minister. Maintaining the master Church calendar, membership database, attendance database, and volunteer roster. Receiving all visitors, conduct tours for rentals and scheduling all events (weddings, funerals, classes, meetings, etc. ). Assessing needs, soliciting and training the volunteers and volunteer team leads to support Sunday service and general Church needs. Establishing, documenting, and implementing, policies and procedures for effective operations of the Church. Managing the publication/distribution of electronic and hardcopy weekly email blasts and bulletins, prayer lists, bi-monthly newsletters, and mass mailings. Attending the monthly board meetings and weekly staff meetings and a one-on-one meeting with the Minister and publishing minutes. Purchasing/maintaining the appropriate office and facility supplies and ensure safety, security, and cleanliness of the facility. Coordinating general repairs and routine maintenance of the building and grounds. 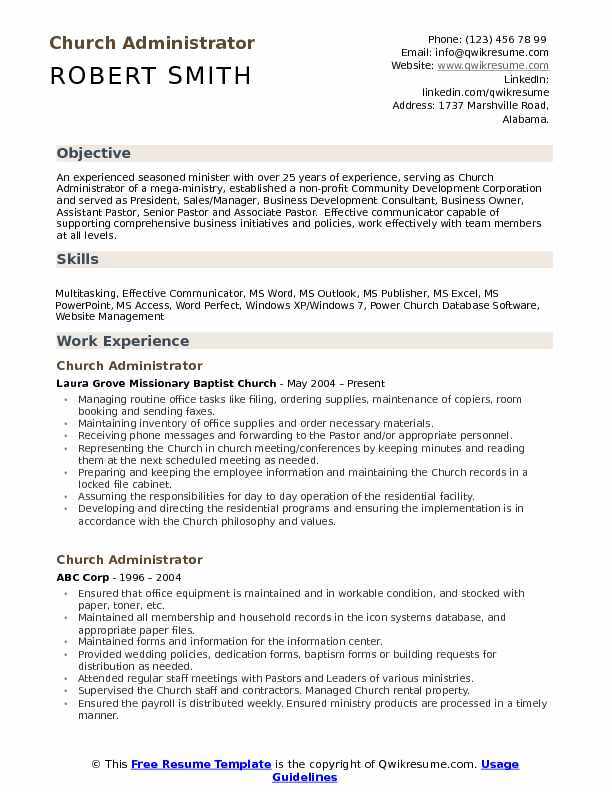 Summary : Dedicated and professional Church Administrator with extensive experience of 10 years in the Church environment. Proficient in Microsoft Word, Excel, PowerPoint and Publisher. Self-motivated and committed to delivering high-quality results with little supervision. Excellent attention to detail, organization, and multi-tasking skills. Team player and problem solver with experience working with confidential information. Implemented a structure to help with church growth, created tools to help with leadership, excellence, consistency, and accountability. Scheduled internal and external meetings, recorded and distributed meeting minutes. Supervised the staff and volunteers by providing guidance, training, and understanding of the job responsibilities. Created and implemented Ministry job descriptions for staff and volunteers. Working very closely with Ministry department leaders and volunteers to ensure they understand their role in ministry, assisting them with Ministry reporting and being available to serve them as needed. Responsible for electronic and print communications including weekly bulletin, monthly newsletter, and e-mail blasts, church database, and records. Summary : Detail oriented progressive Church Administrator II with more than 16 years of experience in administrative support in the private sector. Excellent communication skills possess the ability to foster professional relationships with management. Skilled in Microsoft Office (Word, Excel, PowerPoint, and Outlook), Internet research, as well as customer service. Working knowledge of Access and QuickBooks. 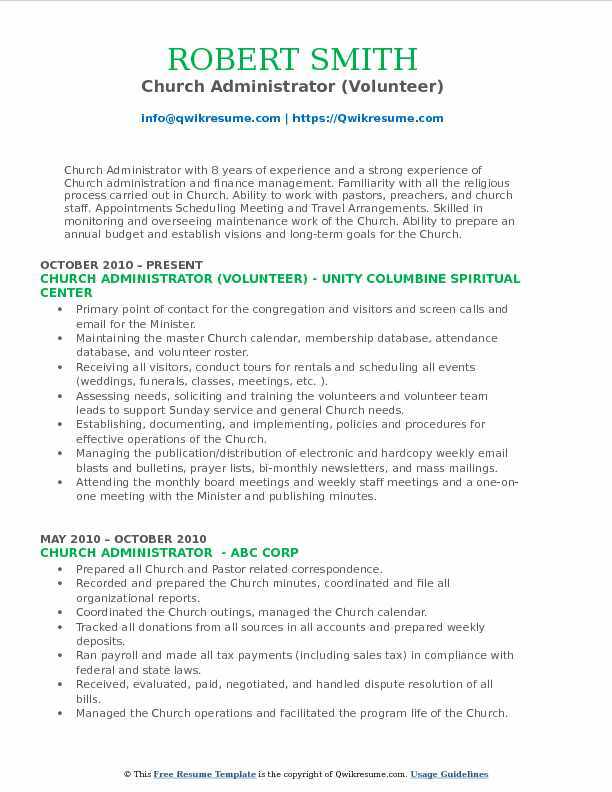 Conducting and managing the work of the Church office, such as greeting visitors, answering the telephone and taking messages, handling mail, maintaining files, ordering and maintaining an inventory of supplies, notifying the Pastor of any emergencies. Liaising as necessary with the Pastor and/or elder for congregation care when congregants need assistance. Responsible of building operations, maintenance and repair, as well oversight of church equipment and service contracts. Working closely with the Church Treasurer, Finance Committee, and Stewardship Committee to conduct the financial aspects of the church administration. Maintaining all Church files and records, as assigned in cooperation with the council secretary. Assigning the duties and supervising the activities of the sexton and conduct their annual performance evaluations. Providing or arranging for support to the committees and church activities as assigned, such as scheduling use of Church facilities by internal and external groups. Attending staff meetings, providing reports on administrative matters, concerns, and issues requiring attention to a staff member. Summary : Church Administrator with over 17 years of administrative management, inside and outside sales, and Operations management with emphasis on organization, communication, customer service, and self-motivation skills. Administers the effective policy and administrative decision-making capabilities through the promotion of the big picture perspective, excellent thinking and communication skills, operating in a spirit of excellence, integrity a spirit of faith. Working with the staff and church teams to achieve the goals and objective of the congregation. Providing for the maintenance, repair, insurance, and upkeep of all church properties and facilities. Working with the proper Church team in the construction, remodeling, and equipping of church facilities and properties. Supervising the administrative support staff and overseeing all office procedures, operations, and equipment. Developing and administering the policies and procedures concerning personnel and the usage of all properties and facilities. Serving as principal spokesman for policy and procedural interpretation. A member of the administrative council and an ex-officio of all other church teams and committees. Maintaining a Church calendar for the scheduling of activities, events, and worship teaching opportunities. Developing and maintaining the support staff job descriptions for each job position. Establishing a performance plan for each support staff employee. Conducting the performance reviews yearly and prepares evaluation reports.